Nuclear delivers award-winning, tough, gritty obstacle races which are held over various, undulating terrains including man-made obstacles and awesome, natural features. Course distances and race formats can vary from 5k to 42k. When taking part in a Nuclear Race expect big obstacles, highly organised events and relentless amounts of mud. Nuclear events are challenging enough for the elite but achievable and fun for all fitness abilities. They offer various races throughout the year and are a great option for company team building days out or if you are just up for a gruelling challenge. 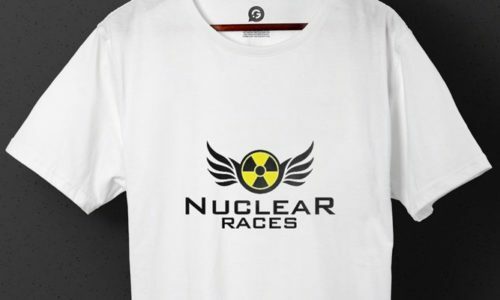 Why not kit yourself out for a race day by taking a quick stroll through Nuclear Races online shop where you will find everything you need from printed T-Shirts, custom hoodies and bags to towels and stickers. Damian at Nuclear Races contacted us because he was looking for a company that could print Obstacle Mud Racers T-Shirts, which were to be given out for free once a racer had completed one of their events. The T-Shirts had to be high quality and also match Nuclear Races trademark colour scheme. The T-Shirts also had to be perfect for competing in other events without becoming damaged. We opted to use screen printing as the printing technique as well as using plastisol inks. The reason for this is, with screen printing we are able to use Pantone colour matching to ensure that the T-Shirts and printing all matched the desired colours to perfectly replicate Nuclear Race’s brand image. The plastisol inks are very durable and will survive a run full of mud and obstacles. “Nuclear Races offers all our Obstacle Mud Racers a free T-Shirt once they have completed one of our events, therefore, we had to find a printing company to logo up our tops. We contacted a few printing companies to see what they could offer and we very quickly found that Garment Printing was the one to go with. Since working together on the first batch of T-Shirts, Nuclear Races and ourselves here at Garment Printing have been working together for well over a year. We are proud to be the printers for the majority of their merchandise. Whether it’s a new design or a repeat design, Damian will send over the logo together with the quantities and then we will prepare a visual for approval before going to print. Like this we make sure no mistakes or misinterpretations have been made.